What about Solid State Amps? How do you get a good sounding distortion from them? Clipping transistors do not sound good IMHO. I haven’t found a solid state amp that can overdrive with anything even resembling good distortion. Most of the time the distortion they produce is because of a model of some sorts. I used to play with a Roland JC-120 – great amp! That was nothing but clean, but I loved it because it took to pedals so well. So an overdrive is more of a symmetrical wave and a distortion asymmetrical? What you’re describing is two different kinds of distortion. I don’t know all the tech stuff behind all that acoustic theory, but symmetric distortion has to do with odd-ordered harmonics while assymetric distortion has to do with even-ordered harmonics. While it’s not necessarily academically recognized, a good discussion of this subject can be found here: http://en.wikipedia.org/wiki/Tube_sound. With respect to overdrive vs. distortion, remember, in the strict sense, overdrive or over-powering causes distortion. The two terms really aren’t interchangeable as far as I understand. I think a lot of the confusion comes from people describing the distortion they hear; for instance, “It sounds like an overdriven amp.” Unfortunately, a lot of people mistake the “overdrive” term when it’s used that way as distortion. Overdrive relates to input gain, whereas distortion is purely output and the result of input gain exceeding output capacity. Interesting article / topic but I’m not convinced. I believe the difference lies in the type of clipping. Overdrive was when you drive past the limits of analog componentry. As this was analog, you tend to get soft clipping rather than a more digital hard clip. I.e. overdrive /soft clipping is where the top / bottom of the waveforms are compressed -> some crazing = overdrive. Though the wonders of science, you can hard clip things, so rather than compress the waveform over a certain limit you just chop it off = distortion. 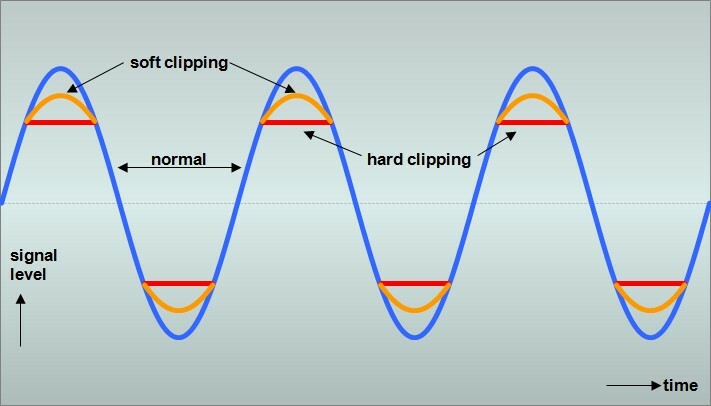 Shows, 2nd one down being hard clipping, the wave forms are just chopped off, the last one being soft clipping, the tops are compressed. So if I want to enhance the sound of my guitar and let its sound shine, play chords etc then an overdrive ftw. If I want to flatten my sound a bit (lead), have some higher gain or something along those lines, then distortion ftw (or extreme overdrive which will be the same). Unfortunately some pedal manufacturers are using either for whatever is more marketable. Ah lol, didnt thoroughly read the last paragraph where you went into clipping, good stuff. 🙂 It’s all good, Jon! Thanks for the contribution! I found some interesting models of Mayones guitars. What can you say about this line ? Check out Empress Arts Multi drive, this product has fuzz, overdrive and distortion. They run parallel not stacked, so it like blending 3 amps together. 3 band eq along with other filters and eq switches make this pedal very tweakable. Check it out on Youtube, it’s like 3 pedals in 1.
on October 5, 2011 at 6:01 am | Reply l.v. Dunno but maybe this dude [http://www.uberproaudio.com/who-plays-what/155-rushs-alex-lifeson-guitar-gear-rig-and-equipment] used it for that very application..? This is a great article. It really explains the differences in a way that beginners can understand it. Thanks, Shaun! The article has evolved over time as my own understanding and experience has evolved as well; plus, I also found some nice tidbits to help explain the differences (like the oscillator images). I used distortion pedals as an overdrive for along time (and suffered). Using a clean boost pedal was a real game changer after realizing that I was experiencing tons of signal loss through my chain of effects. A decent boost/overdrive pedal can recoup some of that. You might try using a boost pedal after your pre-amp. I learned this trick from watching an interview with Gene Baker. He puts one at the end of his effects loop, right before the return jack. It provides just a little bit of volume boost, but it makes sure your power tubes get saturated. Great article! Made a lot of sense. I have a question though. I’m looking at getting an overdrive pedal to use in the way you describe using your Timmy, seeing your amp up to almost break up and the pedal pushes it past that point. But if an amp has two channels wired exactly the same, you could just switch to the second channel set to an overdrive sound and get the same effect, right? If someone is able to let me know if I’ve interpreted this correctly that’d be great, thanks! Adam, you can definitely accomplish that, but to achieve breakup, you have to increase input gain, and typically that will involve a lot more volume, unless your channels have independent master volumes, which most don’t. One overdrive that I’ve actually been using in place of my Timmy is the EHX Soul Food. This is a Klon copy, and it absolutely rocks. I does color my tone, but in a real good way. The great thing about it is that I can set it for lots of breakup but not too much input gain, so I can benefit from my amp breaking up AND take advantage of the great clipping tones from the pedal. AND it’s only about $65-$75. Total steal! Bill, one thing that I always have on my board is a transparent booster. I use the Creation Audio Labs Mk.4.23 Clean Boost (http://www.creationaudiolabs.com/#!mk423/cq2x). If I want a bit of extra chunk in my overdrive sound, I use either a Paul Cochrane Timmy (known for its transparency), or more recently have been using an EHX Soul Food Overdrive based upon the Klon Centaur. I love the Soul Food! While it does add a touch of color (which is extremely subtle), the sustain and voicing it provides outweigh any coloring concerns. The Timmy was my go-to for a long time. It is also fantastic pedal. But Paul mentioned to me that it may not sound as good with Blackface amps. But that was several years ago. What’s great about getting a Timmy is you can speak with Paul directly, and he can guide you. Great explanation. I use a MI Audio crunchbox (volume all the way up and gain at 10 o’clock) to boost my JCM 800 (preamp on 50%). It works for me. Am I doing anything wrong? I mean, can I damage my equip doing that? Do you recommend any changes? Thanks! That shouldn’t do a thing. With master volume all the way up, all you’re doing is making sure that the whole signal goes to the power tubes. But with the preamps at 50%, you’re pretty safe. But damn! That must be loud! My attention span is set to 0 on good days, and I started reading because I couldn’t sleep. But I managed to read this entire article. You filled in so many blanks for me here. Very thorough. And the visualization of clipping helped oodles. Awesome! So glad you enjoyed! This article has actually been a work in progress since I originally wrote it and I’ve added insights I’ve gained from experience. In any case, it’s great to hear feedback like this! Thanks, Alex! This is a post that I watch fairly closely because it has become my most active post – I guess I hit on something with it. As such, I actually update it as I gain more insight. 🙂 Have a great one!